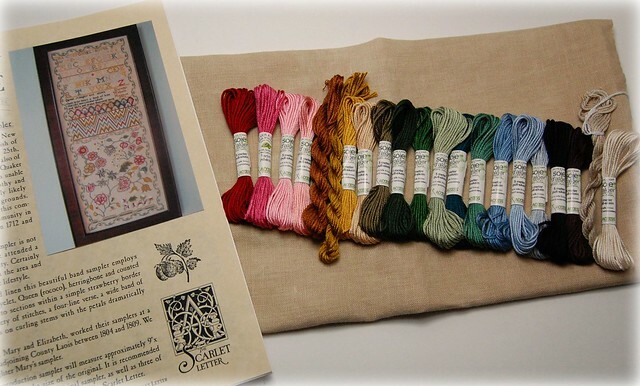 Dorothy Walpole linen and threads, a photo by Nicole's Needlework on Flickr. Another future start! Probably the very near future. I ended up unkitting Ann Smith to kit this. I just love this design!! The linen is 40 ct. Vintage Pecan Butter and the threads are Soie d'Alger. Sooooo pretty! Me want... lol! I know I'm going to break down! It is so pretty !! I can't wait to see your progress. I love the color of that linen. Thanks for posting a pic of your linen Nicole... this is the first time I've seen Pecan Butter. Your Dorothy will look fabulous. This could not be more beautiful!!! I think this will start a frenzy of more people wanting to stitch it. Sign me up! Such lovely colours, cant wait to see your progress. Enjoying Elizabeth and your stitching very much, and now know that will continue with gorgeous Dorothy up next! Love the linen color, wonder if it comes in wimp count. Gorgeous colors--I'm loving working on Dorothy, and I cannibalized Ann for the threads also. I'm in deep doodoo now. J'aime beaucoup les couleurs et le modèle. Je vais suivre l'évolution avec attention! I'm not normally that much into repros, but I do love this one. The colours are so pretty and I like your fabric choice too! WOW!! I just love that red and pink! I love this design too and have been so tempted. I can't wait to see your start. I might have to cave as well (if I can find any stitching time!!! Beauuuutiful!! I am so tempted by the Attic's version... what do you think? So that is what Vintage Pecan Butter looks like! I've been wondering. It is beautiful with the threads for Dorothy! I'm sure Ann won't mind waiting. Gorgeous and I love the new blog look!!!! Another beautiful sampler! I have a whole lot that I am attempting to kit up at the moment. What a pretty sampler. Looking forward to watching your progress and seeing the colours all working together.